The news that Toyota plans to launch one of the first commercial hydrogen fuel cell cars in 2015 is significant for the oil refining industry. Since cars evolved from steam to the internal combustion and then diesel engines, sparking the need for fossil fuels, oil refining has been heavily dependent on developments in the automotive sector. When Henry Ford introduced the Ford model T, making cars affordable to most people, the demand for gasoline increased. As a result, refineries started to develop new technologies, such as the hydrocracker and the fluidised catalytic cracker (FCC), to produce more gasoline and diesel to meet this demand. Traditionally the automotive industry was driven by fuel economy (miles per gallon and price per gallon), but now people have become more sensitive to the environmental impact driving cars. This has led to the development of natural gas vehicles (NGV), liquefied petroleum (LPG), electric and hybrid cars. 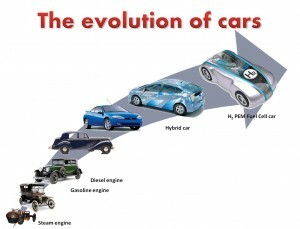 Now, Toyota is leading the next stage of the automotive evolution with the hydrogen fuel cell car. As the by-product of generating power is steam and heat, hydrogen is arguably a clean fuel, provided it is generated from renewable energies. In order to meet the short term demand, refineries may increase their hydrogen production capacity. Keeping the aim of reducing carbon emissions in mind, hydrogen will need to be produced from a carbon-free source, such as electrolysis, using renewable or nuclear energy. Posted on Tuesday, September 16th, 2014 at 9:29 pm. © 2014 PIP. All rights reserved.